For his birthday, I gave Rob a Blickensderfer No. 9 which is a really ingenious machine. 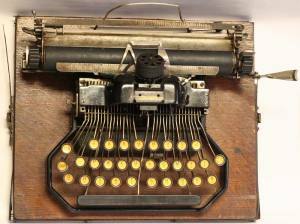 Although it was built in 1893, it might remind you of the typeball on an IBM selectric. Pretty cool, huh? It’s at the repair shop now getting a cleaning, so you’ll have to wait to see video of it in action. Don’t expect me to actually type on it, because the keys are not laid out in the standard QWERTY format.Â Still, it’s pretty keen, huh? Rob was about as excited as I’ve seen him over a gift.Â He kept pushing the keys reaaaaally slowly to watch the type element spin.Â It was cute. Is the keyboard laid out in the AZERTY format?